Run ads on Google, Bing, and Yahoo search pages. That is where your prospects are searching for your products or services. These ads are Pay Per Click (PPC) ads. You only pay if the viewer clicks on your ad to go to your website. These are text ads of three lines. Display or Banner ads can be bought on a PPC or a Cost Per Thousand basis. 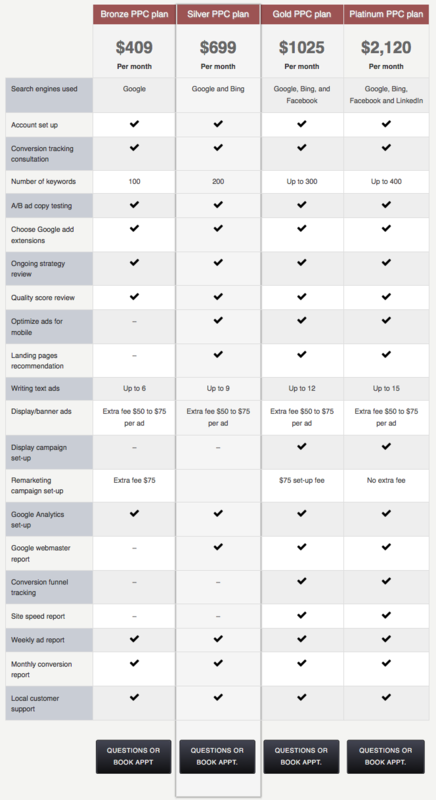 Your actual ad campaign expenditures are paid directly to Google, Bing, and Facebook. Our agency fee is 20% of your ad spend with a minimum fee shown on the table. The set-up fee is usually equal to a one-month fee, but are custom bid.These fees are for the set-up, monitoring, and management of the campaigns.